THE CYLINDER HAS GOOD ACTION.HAS NO DINGS,DENTS OR REPAIRS. 9 1/4" TALL,APPROX. 8 1/4" ACROSS THE BOTTOM BY APPROX. 5 1/4" DEEP.WEIGHT APPROX. 10.2 LBS. ALSO CAN BE PICKUP FREE IN RHODE ISLAND. Vintage German Cuckoo Clock, Donauwellen Walzer Swiss Musical Movement. Clock will not stay running, Cuckoo and Dancers work fine. Shipped with USPS Priority Mail. Here is a 1950's era 7-UP Electric Lighted Clock. Clock bulb is burned out, but clock was tested and runs great with no noise. Entire Clock with NO FACE. Great all original piece if you have another face for it. Starburst Atomic clock. Works great. Diameter is approximately 27” Diameter of clock face is 9” Some of the gold is worn on the rim of the clock face. Up for sale is this Starburst Sunburst Syroco Wall Clock. Works perfectly battery operated only flaw is one of the spokes has been broke and glued back on. Have shown close up. There is Japanese writing on the back, see photo. It looks like there may have been an old solder repair by the wind lever but everything functions properly. A nice addition to any collection and no reserve. 6-1/2" tall and 6-5/8" long. The clock is working, the alarm also is working and the light is good. The fireplace lights up and rotates. One of the 2 log holders(in fron of log) is missing. No cracks or breaks in the bakelit. Different bulbs give a different color of glow. Cool old electric clock. This 1937 - 42 General Electric clock, model 4H08, also known as "New Geneva" is excellent working condition. This clock runs quiet and it keeps good time. The red dot power failure indicator works just like it should. There are only a few very minor blemishes to finish as shown. Be sure to note the subtle pinstripe inlay running along the center of the top and continuing down the center of the dial. The large easy to read dial is in beautiful condition along with it's original hands. This New Geneva is quite possibility the nicest one that you will find for sale any time soon. This clock will be packaged very well to ensure safe, damage free shipping. The shipping cost is for the continental United States only. AND NEEDS A NEW BASE FOR IT. Very old Lux Scotty dog clock in great shape for display. Good strong colors. Original key. Check out the photos for condition. In the fifth photo you can still see the original wire. A spare is included and has never been opened. Key plus original insert with instructions to set up are also included. All parts sold as is. Beautiful Regula wooden cuckoo clock with RARE to find birds with glass eyes! No scents or stains and from a smoke free residence.The clockworks were also made in Germany by a master clockmaker, Albert Schwab Karlsruhe. Full and 1/2 Hour Strike and gong. nicks and scratches. WORKING CONDITION. 1930's Seth Thomas electric clock, model "Kent ". Solid wood case, maple, I think, with nice burl overlay on front. Brass sash, good round flat glass lens. Rear door opens on hinges, missing instruction label on the inside. Cool mid-century modern battery operated wall clock by Karlsson. Measures 13 1/4" in diameter. CLOCK HAS BLUE RHINESTONES AROUND THE EDGE. MADE IN GERMANY. Case lookalike nicole plated brass. Wear to blue mirroring. Don't miss out on the opportunity to add this piece to your collection with 100% of the proceeds benefiting Howard Brown Health in Chicago. New ListingVINTAGE ONYX ART DECO WHITEHALL HAMMOND SYNCHRONOUS ELECTRIC MANTLE CLOCK, RUNS! This one starts very quickly with just an easy spin of the starter knob. The glass is clear and scratch-free. The brass bezel is very good. Very interesting. From the 1030's. Nice color and no breaks or repairs in carving. Original Bellows are in great working order. Clock size is 24” high by 14 wide and 6 1/2” deep. Lower 48 states only. There is a small crack between #5 & #6 and also between #6 & #7. The clock trim is solid. Very cute retro item. Beautiful Teak Wood and Brass Wall Clock by Stilecraft circa 1960's. Can be mounted on wall or placed on flat surface. 1963, 110 VOLT, THE WOOD PEGS WILL BE REMOVED TO FIT IN THE BOX. In so so used Condition. Sold as is. Not tested. Not perfect. Very dusty. Not complete. Missing parts. Little split on top center. 10” tall not including the chains and weights and it is approx. 11.5” wide. New in the Original Box, but made in the 1950’s or 1960’s era. Images and Scans: Large scans or photos are provided for lot. CONDITION: GOOD. DOES NOT WORK. NEEDS REPAIR. SURFACE, EDGE, SCUFFS, SCRATCHES AND CORNER WEAR. 8" X 4 1/4" X 3 1/4". Such as: flat rate and parcel options. (International does not apply). (It will save you money). Should be an easy fix for the repairman. As found, missing key and with two small loose veneer spots on case as pictured. 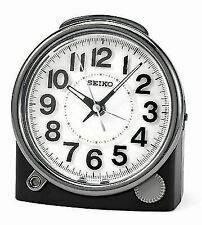 A black cased Phinney-Walker travel alarm clock. Marked Made Exclusively For Phinney Walker In Germany. Luminous hands and numbers. A little wear. Clock runs and alarm works but it has not been tested for duration or accuracy. Clocks have come a long way since humans created the originals by marking off the shadows on trees. Now, these staples of home decor not only keep time reliably throughout the day but also can be works of art. Whether they are ornate or simple, staid or silly, contemporary, vintage, or antique, clocks are not only necessary but objects of fascination. Wall clock: These include school, industrial, and regulator clocks with traditional circular movement. 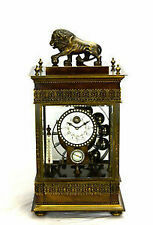 Lantern clock: These are antiques that used to be carried at night or attached to horse-drawn carriages. 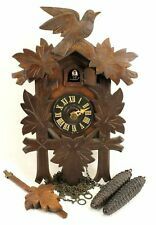 Cuckoo and woodchopper vintage clock: Woodchopper clocks differ from cuckoo clocks in that a woodchopper comes out of the door instead of a bird. Shelf or mantel clock: Includes tambour and bracket types. 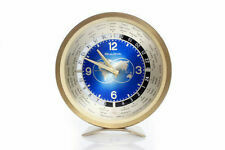 Desk clocks are a subset of these timepieces. Neon clock: These light up with neon when plugged in. Alarm clock: Includes home and those made for travel. Grandfather clock, or long case: Though many are quite large, some are small enough to be desk clocks, and their classic chime is unmistakable. What materials are antique clocks made of? Metal, including brass, sterling silver, and aluminum. Wood, including walnut, mahogany, and oak. Bakelite, which is a type of plastic that can be brightly colored. What special features can vintage clocks have? World maps on the dial face. Coins that take the place of numbers. Lighted bases, which look great on any wall. Shapes such as airplanes, rolling pins, ship’s wheels, houses, and starbursts. World clocks that tell the time in other parts of the world. Moving figures. Besides cuckoos and woodsmen, these vintage timepieces can have dancers and playing children. What styles are vintage clocks? Art Deco. This sleek style used Bakelite or shiny metal along with metal accents, often with black and white faces. Modern. Many craftsmen in the era after World War II were dedicated to the idea of form following function, and this also applied to clockmakers. Clocks made in this era were round or square, had Roman or Arabic numerals on the dial face, unadorned cases, and simple hour and minute hands. Victorian. 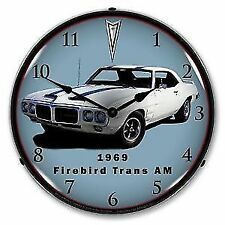 Anniversary clocks were created during this era. They are so named because they only need to be wound once per year. 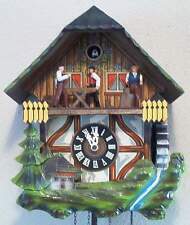 Cuckoo clocks have been around since the 17th century but became more common around the world during the mid-19th century. Antique timepieces made for the mantel also proliferated in this era. Empire era. This era occurred during the reign of Napoleon I. The regulator clock had been invented prior to this period, but here it became more common. It was known for its accuracy.